Applications - sent by a customized script that was triggered by the Analysis. Some examples: ‘Two trucks are out of route’, ‘Your refrigerator temperature is higher than 36 F’. Tago system - used by Tago backend to notify users about the system or your account. For example: ‘There is a new application in Healthcare industry that you may be interested’. When you log in to your account, you can see all your notifications in the top right corner of the admin page. A number in red, will inform how many new notifications you have. If you have more than 99 notifications, it will show as 99+. You can enable the notification in your browser to be notified even when you are in another tab or screen. Check the configuration of your browser. On the Notifications window, you can filter by read status or by the type of notification. Also, you can use the search field to refine the results. Usually, notifications received from Other users are related to authorization request asking you to accept dashboards, buckets, and profiles. In these cases, you need first to accept the request, before the shared item is available to you. Notice that the user who sent the request to you is able to track the status of the request by checking into the ‘Share’ tab of each item (Bucket/Dashboard/Profile). After you make a decision and choose to accept or ignore a specific notification, the system will change it to a faded-like color. Tago automatically removes all the ignored notifications that a re older than two weeks. 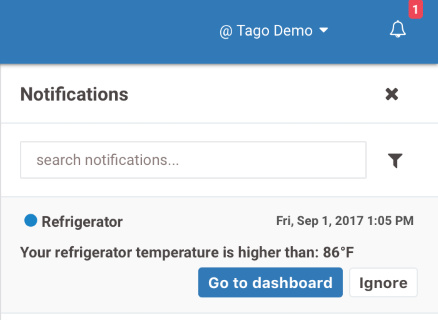 Application notifications can give you the option to be redirected to a dashboard that can contains more information about the event. The content of the notification and the button that links to the dashboard (optional) is defined by the developer. To learn how to create an Application notification from an Analysis, check our sdk documentation.